THE FOURTH EPISODE of the first series of the BBC’s 2008 remake of Terry Nation’s Survivors was broadcast ten years ago today, on 9 December 2008. The plot of episode four pivoted on a storyline lifted directly from the pages of Terry Nation’s 1976 novelisation, which the show’s creator himself adapted and reworked from his own script for the sixth episode of the original TV series Garland’s War. This meant that Simon Tyrell’s script for the 2008 remake was the third retelling of the story of Jimmy Garland’s efforts to win back control of his home. While Abby’s determination to continue the search for her son leads her to an unplanned entanglement with Garland, her settlement begins to unravel in her absence. Many of her compatriots decamp to Samantha Willis’ settlement; where they soon find their sense of mutual loyalty coming apart; while, back at their own base of operations Anya and Greg find themselves under attack by marauders. By the end of the episode, Abby’s community learns the importance of genuine, unselfish collective commitment – and its fragility in this new world. Abby also endures new disappointment in the search for her son; but finds some temporary solace in the moments of intimacy she enjoys with Garland. THE FIRST SERIES of the BBC’s 2008 remake of Terry Nation’s Survivors reached its half-way point ten years ago today, as the third of six episodes premiered on BBC One. The third episode reintroduced the character of junior government minister Samantha Willis (played by Nikki Amuka-Bird), who is revealed to have set up a community, with a level of organisation and purpose which initially inspires Abby Grant. The brutal realities of Willis’ regime are quickly revealed, and Abby is repulsed by the settlement’s cruelty and heartlessness. The character of Willis and her ambitions will play a decisive role in many of the series’ storylines. Abby’s decision to record a video message at Willis’ suggestion, alerting other survivors to her hunt for her son Peter – and revealing in the process that Abby recovered from the Death virus (rather than being unaffected by it) – will have major pay-offs in the series one finale, and set in train events that shape the storyline of series two. The episode also features a standalone story, involving a farmer and his family who have isolated themselves from the plague, lit up by a superb performance by Sasha Parkinson as the precocious daughter Kate. It also leads to what will prove to be a temporary improvement of relations between Greg Preston and Tom Price (a hopeful development which will also be ripped apart in the series one finale). WE ARE IMMENSELY proud to announce the release of Terry Nation’s Survivors – Series 1. Our original audio series begins again with the plague outbreak, introducing new characters before running parallel with that TV show, as Lucy Fleming (Jenny) and Ian McCulloch (Greg) reprise their roles. Carolyn Seymour (Abby Grant) also has a cameo role, and will appear in a larger capacity in Series 2. When most of the world’s population is wiped out, a handful of survivors are left to pick up the pieces. Series one of the new Survivors audio adventures is available to buy (in CD format or by digital download) from the Big Finish web site. Series two will be released in June 2015. Find out more about the Big Finish audio dramas from the Survivors: A World Away blog. Please note: These audio dramas are set in the time and place of the original Survivors (1975-1977) and NOT in the world of the Survivors remake (2008-2010). A not-heard-before press interview with Julie Graham (Abby Grant) from the 2008 pre-series-one promotional campaign (by journalist Katy Blackwell) has been made available on the SoundCloud streaming service. In the 5m 25s interview, Graham discusses the then-forthcoming first series, the character of Abby Grant, the contemporary relevance of the show, the making of the first series, and more besides. 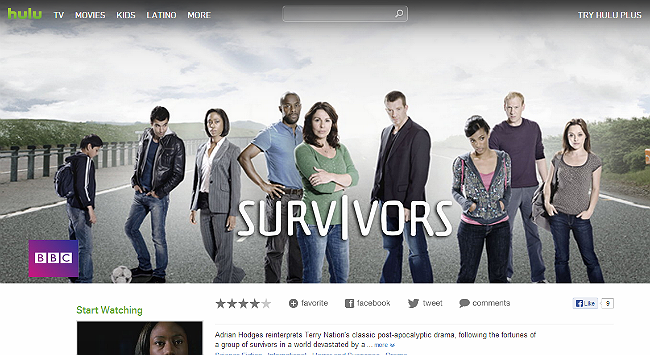 A repeat broadcast of series one of Survivors begins on the BBC HD channel at 22:30 on Tuesday 17 January 2012. 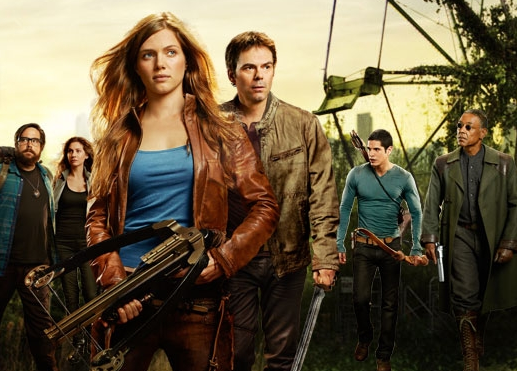 Series one of Survivors has begun transmission on the national, free-to-air PRIME network in New Zealand on 29 July 2010. Thanks to AH for alerting the blog to this news. Series one of Survivors secured a low-key late-night repeat on the BBC HD Channel in late July and early August 2010. The ninety-minute first episode was shown at 00:30 on Tuesday 27 July 2010, with episodes two to five then being shown at 01:00 between Wednesday 28 July and Saturday 31 Juy 2010. The repeat run concluded with a showing of episode six at 01:00 on Tuesday August 3 2010. The series one repeat meant that all six episodes were available for seven days following transmission on the BBC iPlayer service. There is no indication as yet as to whether the BBC HD channel plan to repeat broadcast Survivors‘ second series. Italian TV station RAI-TRE which premiered series one of Survivors in September 2009 only to suspend transmission after showing just three episodes begins a repeat showing of series one on Monday 24 May 2010 at 11.10pm. Italian Survivors fans naturally hope that this time the broadcaster will commit to showing the entire run – of series one at least. Many thanks to Luca for alerting the blog to this news.